On June 23, 2016, 33.6 million people went into polling stations across the UK to decide whether Britain should remain a member of the European Union. Fifty-two percent of them said no. Now, almost a year later, the UK will vote in a snap General Election to determine how that exit will play out. Whatever your political views, one thing is clear: Brexit and the result of the upcoming election could have a huge impact on the tech industry’s access to talent, and therefore the UK’s ability to remain competitive as a nation. A recent report found the tech sector is growing twice as fast as the wider UK economy and that digital jobs are being created twice as fast as non-digital jobs. Hold back the growth and momentum of the tech industry and you potentially damage the entire UK economy. In other words… this isn’t just a tech sector problem. We wanted to dig deeper into this issue and discover the true scale of the challenge ahead. 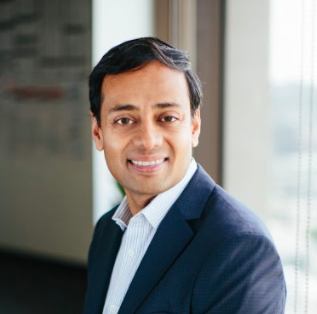 Since Hired is a global platform and because we facilitate the job-searching process from the first interview request all the way to the final offer, we’re able to see patterns in both candidate and company behavior that give us unique insight into this issue. 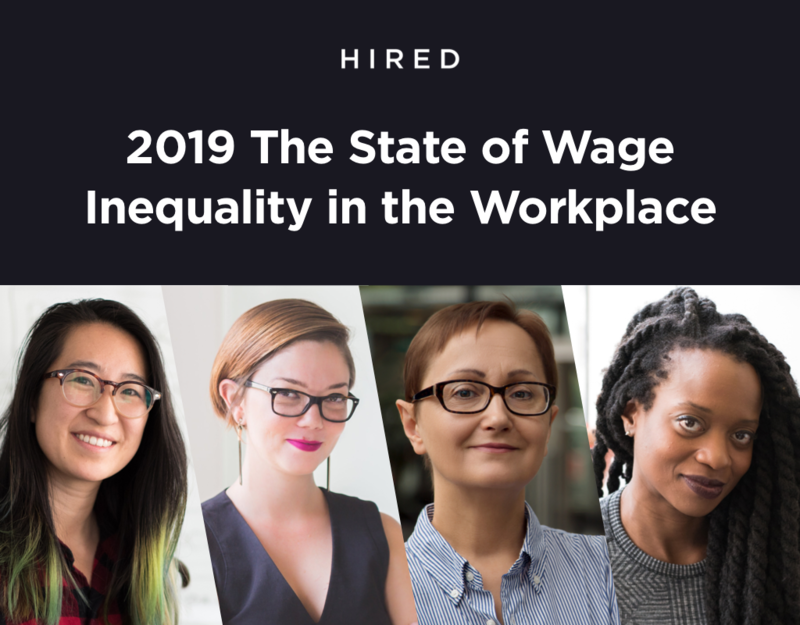 We’ve supplemented this with survey data collected from the tech workers who are part of Hired’s platform. These are our findings. The UK has long relied on foreign labor to help power its economy. In fact, the Office for National Statistics estimates that one in ten UK workers was born outside of the UK. In the tech industry, some skills are in such short supply that UK-based companies offer foreign candidates an average of 28% more than local candidates in order to fill their open roles. For these reasons, we wanted to understand Brexit’s impact on the global tech community’s interest in working in the UK. To do this, we looked at the total pool of candidates who had accepted initial offers from UK-based companies, and found that the number of foreign candidates in this pool is less than half what it was pre-Brexit. We also looked at the rate at which these individuals accepted initial offers from companies in the UK, which is another gauge of how interested they are. We found that their acceptance rate decreased by nearly 20%, whereas the acceptance rate from local candidates was flat over the same time period. The reduced interest from overseas workers isn’t the only concern – it seems British employers are less confident in recruiting from abroad since the Brexit vote. 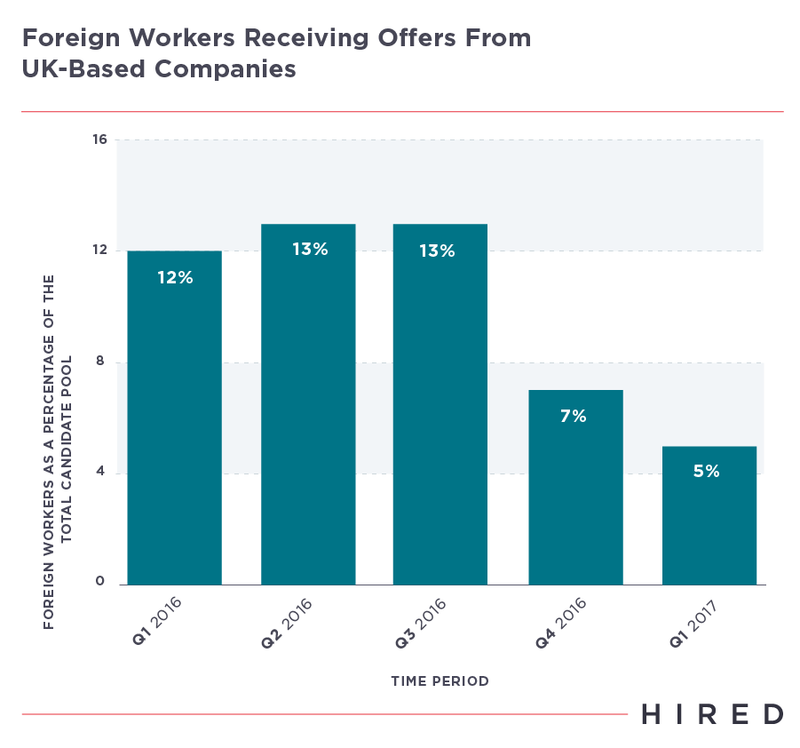 Our data revealed that the percentage of British companies sending offers to candidates outside the country fell from 25% at the beginning of 2016 to just 18% a year later, a decrease of almost 30%. The shrinking pool of UK companies that are recruiting foreign talent is one indication of Brexit’s impact on tech hiring. Another metric is the representation of foreign candidates in the total talent pool, which we found has also significantly decreased. In fact, the number of offers given to foreign candidates has gone down by 60% since Brexit. 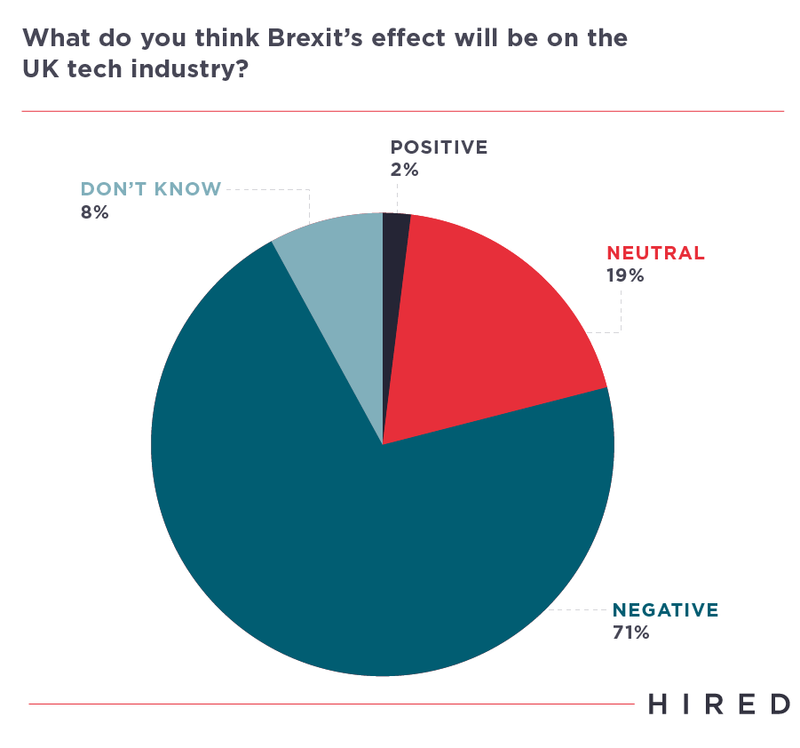 To get an even fuller picture of Brexit’s impact on the UK tech sector, we decided to survey our UK-based candidates to understand how they are feeling about the current environment. When asked whether the UK’s exit from the EU will damage the tech industry, almost three-quarters (71%) of respondents said it would. Even more tellingly, when asked about their biggest concerns, UK tech workers listed Brexit above all other issues, followed by happiness at work, personal development, and salary. This last point is perhaps unsurprising given that, according to our 2017 State of Salaries report, UK tech workers have one of the lowest average salaries of the 16 markets we examined, and their purchasing power has decreased by 17% over the last year because of fluctuations in the pound. If UK tech workers are currently unhappy in their jobs, don’t feel they have the opportunity to progress, and believe they’re underpaid, there is also the possibility that they will become more likely to leave the UK. A further 72% of tech workers believe Brexit has already brought uncertainty to the UK’s tech sector, while more than three-quarters (77%) believe there will be uncertainty a year from now. And that uncertainty translates into real difficulties for individual tech workers – almost a third (31%) anticipate it being harder to find a job in the next 12 months. The above figures are concerning enough in themselves. But while UK tech workers aren’t feeling particularly positive about the future, how concerned should we be about the wider industry? Very, it seems. 70% of those we surveyed have considered leaving Britain altogether in the wake of Brexit. The majority of them plan to move to other European cities, though North America and Australia also scored high as potential relocation destinations. Given the increasing need for the UK’s tech sector to rely on homegrown talent in the wake of Brexit, perhaps one of the most worrisome findings to come from our survey was the potential impact on entrepreneurialism and innovation in Britain. Eighty-five percent of those we surveyed believe restricting workers’ movement across the EU will inhibit both business and country-level innovation, while only 17% say Brexit could act as a catalyst to grow digital Britain. 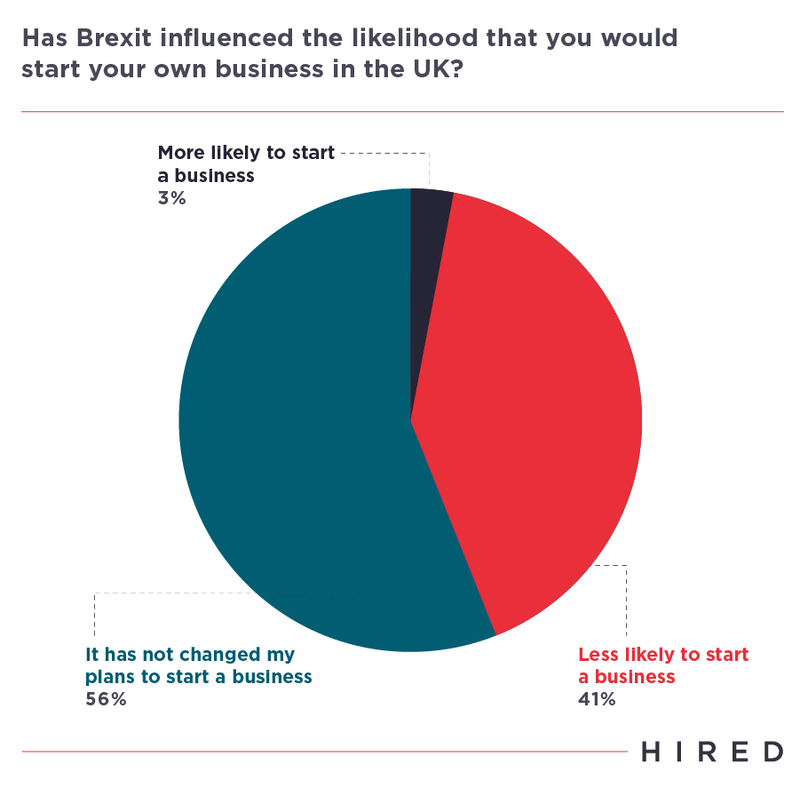 More concerning still, however, is that 41% of all tech workers told us they are less likely to start their own business in the UK as a result of Brexit. This latter point in particular should make politicians sit up and listen. Fewer tech start-ups will likely result in Britain’s innovation economy being less competitive globally, particularly if, as our survey suggests, these talented and entrepreneurial people are leaving for what they perceive as greener pastures. But this is also about the wider economy – if digital companies are producing more jobs than non-digital ones as the Tech Nation 2017 report indicates, and fewer digital companies are going to be created, the future of Britain’s jobs market suddenly looks very uncertain. Hired launched in the UK — our first international market — just over two years ago, and we are proud members of the local tech community. The vibrancy, dynamism, and sense of community that characterize this market make it one of the greatest tech hubs in the world. While we recognize that many of the findings above may seem quite negative, we want to be clear that we’re still very big believers in the promise and potential of Britain’s tech sector. As with all of our data, our aim in sharing this is to call attention to this issue and serve as a catalyst to action. Our sense is that many of the more worrisome findings in this post are a result of the current uncertainty characterizing the political landscape. Job seekers and employers are behaving cautiously until they know what the path forward looks like and can plan accordingly. As the UK looks to map out a more definitive plan to leave the EU and things like skilled worker visas come into sharper focus it will give both sides a better understanding of the rules of engagement. Right now, we’re likely seeing the kind of conservative behavior that comes from massive uncertainty. 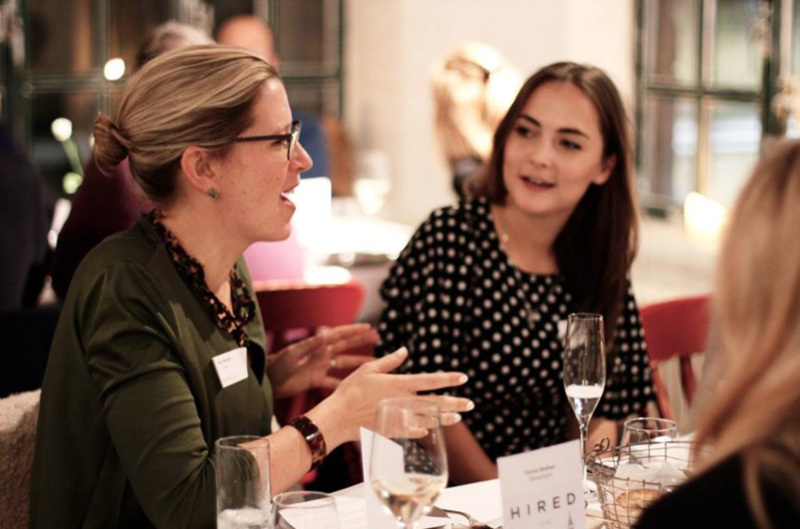 At Hired, our sincere hope is that Britain can continue to be the global tech hub that it has always been, attracting the best and brightest not just from the EU, but from around the world. Ultimately, this moment may prove fruitful for the industry in the long-term as, for example, wages for UK-based engineers — which have historically been quite low relative to other markets — go up. It may also help drive enrollment in STEM fields, which has been declining in the UK over the past decade and a half, and has resulted in a massive skills gap. It could also result in a renewed focus on employee engagement and retention, as UK companies search for ways to keep their current employees happy by focusing on areas like work-life balance, pay and professional development, all of which is detailed in our Dream Jobs report. The bottom line is that no one can afford to complacent at this stage, and we urge businesses, educational institutions and government to work together to help make the path forward as smooth as possible. We’ve all played a role in establishing Digital Britain, and now it’s time to ensure that it continues to thrive.